We often discuss threats to you and your devices. But it’s not only Homo sapiens that can suffer the consequences of poorly protected devices. Today’s topic is how modern technologies can pose a risk to rare animals. Scientists have long used special tags to learn more about the ways and habits of wild animals. They began with primitive objects, such as rings with information engraved on them, but the 20th century saw the rise of more high-tech methods, in particular the use of GPS trackers. These miniature devices let researchers monitor animal movements in real time. The first trackers of this kind appeared a few decades ago. Unlike 1990s devices, modern GPS receivers are compact and can run for a long time on solar batteries that don’t need replacing. The fairly steep cost of high-quality, long-life GPS trackers means that they tend to reach only a select few — usually members of endangered species. Tracker data serves the research interests of scientists, and the trackers also act as a kind of alarm system, alerting conservationists that an animal is endangered. But are GPS trackers secure? Alas, GPS trackers and the accounts that receive information from them are hackable. And that means animal location data could end up in the wrong hands. The carcass of a rare animal fetches so much on the black market that poachers are willing to fork over plenty for the most expensive hacker services money can buy. 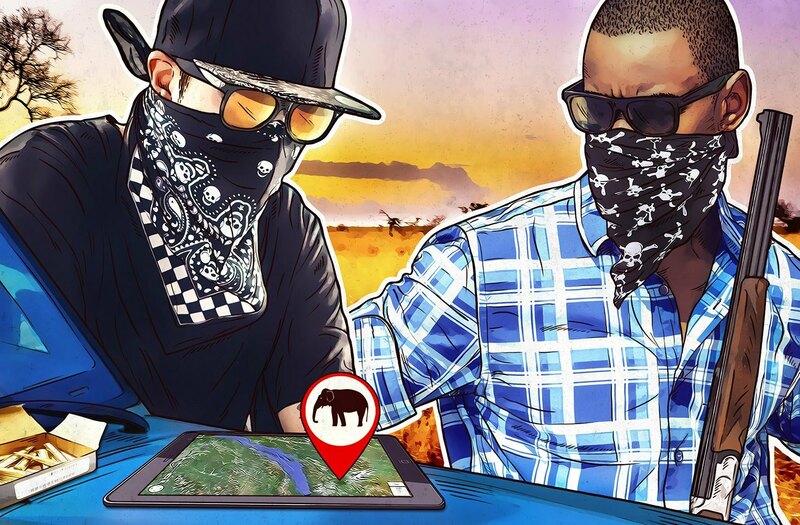 Although as yet there are no confirmed cases of high-cost GPS trackers being hacked, reports of attacks on “tagged” animals that crop up in the news every so often are not encouraging. In December 2012, a collar with a GPS tracker may have been partially responsible for the death of 832F, the most famous she-wolf at Yellowstone National Park. An alpha female and pack leader, over her 17-year life she was observed not only by zoologists, but also by tens of thousands of wildlife lovers. Sadly, her popularity contributed to her death: 832F and eight other wolves wearing cheaper and more vulnerable radio beacons were tracked by local hunters who believed that the animals posed a threat to their livestock. It is still unclear how exactly they managed to home in on 832F. Perhaps the hunters (who remain anonymous) hacked the tracker she was wearing. Or perhaps they just read up on the celebrity animal’s habits; information about her movements had been available in the public domain for many years. In 2013, a group of cyberpoachers showed up at India’s Panna Tiger Reserve. It seems they were trying to track down a young Bengal tiger fitted with a GPS collar feeding scientists with hourly data about its whereabouts with an accuracy of three meters. The criminals tried hacking into the private mailbox of the monitoring program head, Krishnamurthy Ramesh. Although they stole e-mails from Ramesh’s account, which he used to receive information about the tiger, the attack was unsuccessful because the tracker data was encrypted. There have been other cases, too, when modern technologies designed to protect animals have instead endangered their lives. Take it as further confirmation that you can’t have too much security. Therefore, scientists must always keep careful watch over accounts used for gathering valuable data and think twice before revealing the location of a rare animal to the general public, even if their intentions are good.